The Whaling Museum at Sag Harbour, Long Island, is a remarkable cabinet of curiosities. There isn’t a hierarchy and there isn’t a narrative or simple message. Located in the former Masonic Temple, a remarkable building originally built as a home, it contains a wide range of products of 18th and early 19th Century whaling industry as well as aspects of town history. From a cabinet of walking sticks with ivory handles, to memorials made of whale vertebrae, to the tools for carving up the carcases, all the ephemera of the industry is represented – and it’s not all scrimshaw. But in amongst this is also the stuff of seafaring: the medicine cases, the shackles for punishment and the ships logs. There are even Inuit artefacts collected by sailors, and a display indicating the relationship between the indigenous Americans, their own whaling, and the Europeans arriving on the Island. We are so used to the managed learning of museums, that this looks like an installation by Mark Dion. 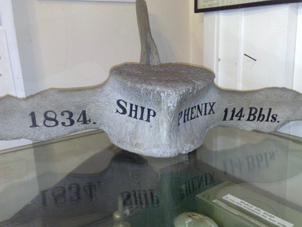 In fact the Museum should contact other museums to do with whaling and make a publication of whaling ephemera from different parts of the world – I found a list of museums connected with whaling at Whalecraft (there are a number in Scotland).